I’ve returned home from a month of travelling to a 2.5 metre by 1 metre bed full of kale. So it is time to practice what I preach and get back to seasonal eating. That means eating kale. Lots of it. The reason I have so much kale is because earlier this year I converted a couple of my raised beds into wicking beds, basically giant self watering pots. I can vouch that they work wonderfully. I came home to two lush beds, one of kale and one of silver beet. They had not been watered for a month, except for rain and the water that was in the bed reservoir when I left. A couple of the kale plants have started to form flower buds, so I decided to use these like broccolini. I combined these with some of the kale leaves in a salad with a Japanese inspired dressing. I think this would work well with any kind of greens. I steamed the kale, chilled it so it remained green, and then dressed it. 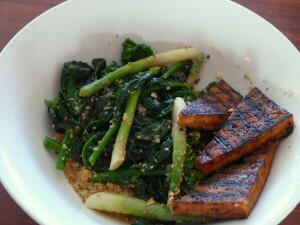 I ate it with some quinoa, a few precious steamed asparagus stems from my garden and barbecued tofu. 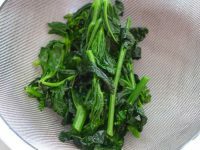 Blanch the kale in some boiling water and then rinse with cold water so that it stops cooking and retains its colour. 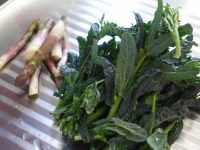 Make the dressing with the remaining ingredients except the gomasio and toss with the kale. Sprinkle the gomasio over the top. LOVE gomasio and sesame oil!